The Belmore Centre is proud to present the ultimate acne treatment; at last, the processes for treating acne have been revolutionised and a solution to the problems caused by such skin complaints made available to the public. At the Belmore Centre, we believe that everyone is entitled to rejuvenated and hydrated skin that is free from blemishes, and that those whose lives have been blighted by acne deserve an encompassing treatment and a release from their worries. Our acne treatment comprises a number of individual processes to create a revolutionary, and comprehensive, solution to problem skin. Clear skin isn’t just for celebrities, it’s for our clients and anyone they choose to tell about our incredible skin treatments. 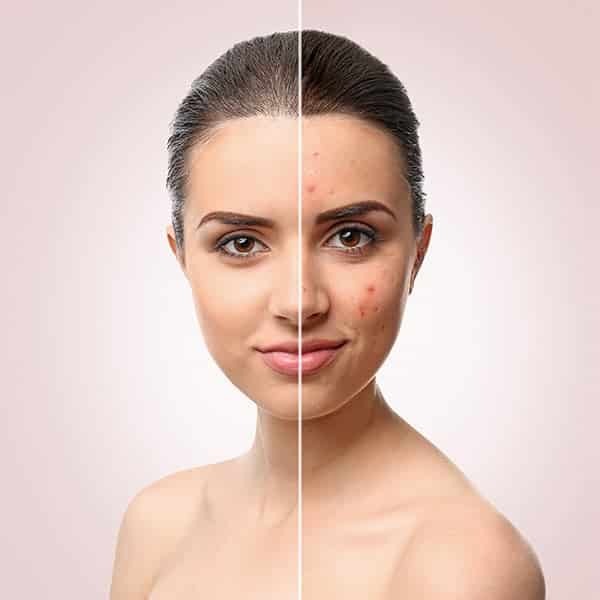 Acne is a complex, long-term skin disease that stems from the blockage of hair follicles with oil and dead skin cells; when the pores are unable to breathe patches of whiteheads, blackheads, and greasy skin are created and unsightly blemishes appear. In minor cases, acne is a nuisance that can blight social lives, but in the most severe instances it can crush confidence, lead to anxiety attacks and cause sufferers deep depression. Acne can be incredibly difficult to get rid of, since no one can say what causes many outbreaks. While the world of retail is filled with gels, creams, lotions and potions for the treatment of acne and the scars it can leave behind, one of the best ways to tackle such skin complaints is to go a little deeper. At the Belmore Centre our acne treatment leaves clients’ skin feeling refreshed, hydrated and, most importantly, free from blockages. Glycolic acid cleansers and gels have become a staple product in the treatment of acne and problem skin; a natural ingredient derived from sugar cane, glycolic acid is an exfoliator, which is capable of removing the top layer of a client’s skin and with it the dead cells that are blocking pores and causing acne. Following treatment with a glycolic gel, serum, cleanser, or peel, a client will notice a marked difference in the feel of the skin; it will feel much lighter, and notably refreshed. Enzymatic peeling paste is a cream that can be applied to a client’s face. Firming as a mask, without becoming hard, the paste is designed to dry the skin and remove dead skin cells from the bonds that keep them attached to the client’s face. This paste is essential before administering a microdermabrasion treatment. Microdermabrasion is a non-surgical, non-invasive treatment that works by applying a specialised diamond tool over a client’s face in order to sweep away dead skin cells and leave the top layer of skin noticeable rejuvenated. Often described as an ultra-advanced skin scrub, microdermabrasion is far gentler than it sounds; the process can soften the appearance of acne scarring and smooth the skin’s appearance. Chromatherapy treatment, or colour treatment, can be used to vastly improve the condition of a client’s skin via a simple sense of wellbeing; rest and relaxation are essential for clear skin, and the introduction of certain colours, such as blue, have been found to encourage such a feeling of peace, as well as reducing a client’s heart rate. Each of these individual treatments would be enough to benefit a client’s skin and visibly alter its appearance, but combined they form an ultimate acne treatment that makes a significant difference to the lives of those suffering from troublesome skin; at last, a solution to acne and the issues it causes has been found! While more severe cases of acne may require second treatments, or repeated visits at regular intervals, one session at the Belmore Centre is usually enough for a significant difference to be noted. Clients’ skin can be expected to feel cleaner and clearer, smoother, and more hydrated, as well as appearing firmer and more structured – elasticity will be greatly improved, owing to the skin’s natural collagen production, which will have been stimulated. Scars may not disappear immediately but their appearance will be reduced and the client’s self-esteem restored. At last, acne sufferers may begin to see a light at the end of the tunnel, and a marked increase in their confidence. The Belmore Centre in Aylesbury is proud to be able to offer an inclusive menu of procedures for acne treatment and looks forward to welcoming clients, and helping them overcome their skin complaints.